The World Blind Union’s (WBU) Right to Read campaign for ratification of the Marrakesh Treaty just concluded two days of meetings in Berlin, Germany. The attendees were mostly the regional coordinators of the campaign, and the news was good. I found the optimism exciting: it seems like we’re moving quickly to getting twenty countries to ratify the Treaty. It even seems likely that it could happen in 2015! The Treaty goes into effect three months after 20 ratifications have been formally deposited with WIPO, so it’s looking great! The hope is to be able to celebrate the milestone globally on December 10, 2015, Human Rights Day. In North America, Canada was rated as “probable” and the USA as a “possible.” There is a fair amount of friendly competition going on to see which country ratifies first. Of course, Mexico might well beat both the USA and Canada, but Mexico is in the Latin America group at WBU. The embarrassing gap during the meeting was the fact that no European countries were considered to be likely to ratify the Marrakesh Treaty in 2015. The political footballs being tossed around are about competency and sequencing: does the European Union (EU) get to sign and ratify the Treaty (exclusive competence), or do all of the countries in the EU have to ratify first (shared or mixed competence)? Also, do you need to implement the Treaty and then ratify it, or ratify it and then implement it? Countries like Germany and France, which were difficult during the Treaty negotiations, are seen as dragging their feet in these ratification efforts, arguing for shared competence and implementation first—bureaucratic obstacles that seem as if they would lose in a court case, but could drag on for years. Moreover, the UK, which is generally pro-Treaty, has political reasons to not bow to EU authority at this time. One attendee pointed out that the cross-border sharing of content wouldn’t be of much use unless you had the USA or Europe on board: that’s where a lot of content will come from for people with print disabilities in the rest of the world. Let’s hope the USA does ratify this year (I'm certainly part of that effort)! While the meeting was going on, we heard that Spain’s government had forwarded the treaty to their parliament for ratification. While it’s not clear where this fits in the Euro-wrangles, the hope is that this development will drive the Treaty’s ratification to the next level in Spain. Even the European mess didn’t dampen the attendees’ spirits. They are busy planning for the implementation phase of the Marrakesh Treaty, assuming it takes effect in the coming year, as well as continuing the ratification campaign well beyond reaching the twenty-country milestone. I was able to share some of our plans at Benetech around implementing the Treaty. We’re doing a ton of work with partners in India, the first country to ratify it, to allow people in India to take full advantage of India’s now-favorable copyright environment. We also hope to lend our Bookshare online library infrastructure to developing world countries not currently able to build their own online library at this time. Additionally, we have over 200,000 copyrighted accessible book titles already available in most countries in the world. I joke that I’m the geek advisor to the activists. However, I’m proud that the joke is true. 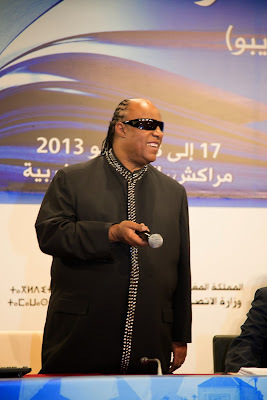 From being on the original drafting committee of what became the Marrakesh Treaty, to being part of the negotiations, to helping convince Stevie Wonder to come to Marrakesh if there was a successful treaty (there was and he came), to helping people with print disabilities in countries all over the world gain access to the books they need for education, employment, and social inclusion—I’ve been very honored to play a small role in helping this expected revolution in accessibility.